"One should act in life according to truth and one's faith," these words formed the core of the beliefs that guided the magnanimous life of veteran freedom fighter and former Prime Minister of India, late Morarji Ranchhodji Desai, who was endearingly referred to as Morarji Bhai Desai by the nation. Among the numerous distinctions and achievements that set Morarji unmatched in the annals of history is the fact that he is the only high-ranking statesman to receive the highest civilian awards of both India and Pakistan ' Bharat Ratna and Nishaan-e-Pakistan respectively. Born on February 29, 1896 in Bhadeli village of Gujarat, Morarji Bhai Desai grew under the atmosphere of orthodox religious upbringing and strict discipline that prevailed in his house. His father was a school teacher. Morarji Bhai did his schooling from St. Busar High School. He graduated from the Wilson Civil Service of the then Bombay Province in 1918 and worked as a Deputy Collector for about twelve years. Being a civil servant is a rare distinction that few will venture to quit for any lofty ideal. But for a man of principles like Morarji Bhai, resigning from this prestigious post to join the freedom movement spearheaded by Gandhiji in 1930 was by no means an uphill task. To the complete astonishment of many friends and family members, he unhesitatingly claimed: "when it was a question of the independence of the country, problems relating to family occupied a subordinate position." He served as a Member of the All India Congress Committee from 1931 and rose to the rank of Secretary of the Gujarat Pradesh Congress Committee until 1937. In 1937, when the first Congress Government took office in the then Bombay Province, Morarji Bhai became Minister for Revenue, Agriculture, Forest and Co-operatives under the Ministry led by B.G. Kher. In 1939, the Congress Ministries resigned in protest against the British Government's decision to engage India in the World War in utter disregard of the opinion of the general population. Morarji Bhai was arrested for participating in the Satyagraha initiated by Mahatma Gandhi during this time and was freed in October 1941. He rearrested in August 1942 at the time of the Quit India Movement and was released in 1945. Following the elections to the State Assemblies in 1946, Morarji Bhai became the Minister for Home and Revenue in the Bombay Province. During this term, many reforms in land revenue were introduced such as the provision of security tenancy rights culminating with the 'land to the tiller' proposition. The police was reorganized and was made easily accessible to the requirements of the public in the safeguarding of life and property. These reforms made him immensely popular and in 1952 he became the Chief Minister of Bombay Province. Morarji Bhai became the Minister for Commerce and Industry in the Union Government on November 14, 1956. He changed his ministerial portfolio to Finance on March 22, 1958. under Lal Bahadur Shastri's Prime Ministership, he became the Chairman of the Administrative Reforms Commission for restructuring the administrative system. As a veteran politician, Morarji Bhai rose to the post of Deputy Prime Minister in the 1967 cabinet of Indira Gandhi. Disenchantment started between him and Indira Gandhi when the latter decided to take away the prestigious Finance Portfolio from him. Although Morarji Bhai acknowledged the Prime Minister's prerogative to change the portfolio of any cabinet member, he believed that his self-respect was hurt as even the minimum courtesy of consulting him had not been done by Mrs. Gandhi. He soon resigned as Deputy Prime Minister of India. 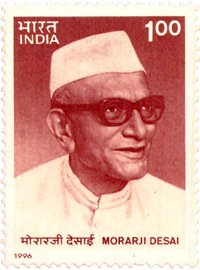 With the split in Congress Party in 1969, Morarji Bhai stayed with the Organisation Congress ' Congress (0) and took foremost part as opposition leader. In 1975, he set out on an indefinite fast on the issue of holding elections to the Gujarat Assembly which had been dissolved. As a consequence of his fast, elections were held in June 1975. The Janata Party secured an absolute majority in the Assembly. After a judgement of the Allahabad High Court against Mrs. Gandhi in 1975, Morarji Bhai was of the view that Mrs. Gandhi should have submitted her resignation. But soon emergency was imposed and Morarji Bhai was arrested on June 26, 1975 along with many other opposition leaders. He was released on January 18, 1977. With the lifting of the emergency and announcement of elections, Morarji Bhai had the daunting task of mobilizing the masses in favour of his party. He campaigned forcefully throughout the country and was the key figure in attaining the landslide victory of the Janata Party in the General Elections held in March 1977. Morarji Bhai was elected to the Lok Sabha from the Surat Constituency. Later he was unanimously elected as Leader of the Janata Party in the Parliament. He was sworn in as the Prime Minister of India on March 24, 1977. The landmark achievements of Morarji Bhai Desai were to improve relations with Pakistan which were derailed after the 1971 war and restoration of political relations with China which received a setback since the 1962 war. His chief contribution was that his Government enhanced popular faith in democracy. His Government annulled some of the legislations passed during the emergency and made it difficult for any future government to impose emergency. In 1979, Chaudhary Charan Singh withdrew from the Janata alliance and forced Morarji Bhai Desai to resign from office on July 15, 1979. Morarji Bhai not only left Prime Ministerial post, but he also retired from politics at the age of 83 years. He lived in the city of Mumbai and died at the age of 99 years on April 10, 1995. As one examines the principled lives of great men like Morarji Bhai Desai who held morals and principles as guidelines of their public lives, (s)/he realizes the immense loss the nation has suffered in their passing away. Most Patriot, Reliable PM of India.